I've read both the Historical and Contemporary works of LisaKleypas and though all are excellent, I prefer her Contemporaries. Once again, her latest release, RAINSHADOW ROAD, does not disappoint. This blurb (and the one included on the back of the book) is misleading. To me, this gives the impression that the greatest obstacle to the romance is nothing but a big misunderstanding and if the hero had been a better man, he'd never have created this mess. Because I love this book and don't want readers to NOT read it for that reason, I want to state loud and clear that there is no false pretense. The hero is not a jerk who takes his friend up on an offer to pass off his girlfriend like used goods. In fact, Kevin and Sam aren't even friends. Sam grew up with Kevin, who was a jerk when they were kids and remains one as an adult. Just in case that "I'm leaving you for your sister" wasn't a big enough clue. 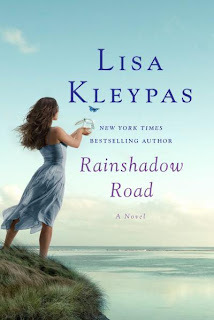 RAINSHADOW ROAD begins when Lucy Marinn is a child. We see the shift that happens in her family, the long-term negative effects that result, and the moment magic enters Lucy's life. Leap ahead to the moment Kevin breaks the news that he's fallen in love with her sister. You can't help but feel bad for Lucy. In addition to losing her boyfriend to her sister, she's kicked out of the home she's built with Kevin and injured in an accident. This book is a perfect example of the old adage "Make your character's life miserable and then make it worse." Thankfully, Ms. Kleypas gives our beaten and bruised heroine a sweet, charming, hot geek with a little magic of his own. Sam Nolan comes from a broken family, growing up with two alcoholic parents. He likes and respects women and is faithful when dating, but anything that smells remotely of long-term or hints at commitment sends him running. As expected, there's something different about Lucy. Which scares Sam half to death. He's determined to avoid her, but fate steps in. This book is about healing old wounds and new ones, forgiveness and acceptance, love and magic. If you haven't picked this one up, I highly recommend doing so today. PS: Though this is the second in a series, I read it without having read the first and had no problems. But if you want to start at the beginning, start with CHRISTMAS EVE AT FRIDAY HARBOR. Just be warned, these books will have you booking your next vacation to San Juan Island. And you might lose a few hours sleep. I know I did. PPS: The next in the series, DREAM LAKE, will be out in August. I am very much looking forward to this one. A tortured here dealing with a ghost. What's not to love? You had me at glass blower. I'm already a Kleypas convert and have it on the TBR. Everyone of her books that I've read has been a winner for me. I love this book! And one of the many reasons I love it is that there is no Big Misunderstanding. Sam is a candidate for my hero of the year--and Lisa Kleypas is one of my favorite writers--because when the perfect opportunity for a Big Mis arises, he actually talks to Lucy and tells the truth. Oh, that more authors would follow suit! I also love the magical realism elements. I've written a post about this love that will be going live at Heroes and Heartbreakers sometime near the release date of Dream Lake, which I also am eagerly awaiting. She's actually a glass artist, Chance. She cuts glass and makes gorgeous windows, though she is interested and knows about glass blowing as well. Janga - I got really worried there for a second thinking, "If he doesn't tell her this is going to get annoying" and then he told. I was so relieved and happy and yet, there was still tension and conflict and this woman is like a miracle worker the way she weaved this plot. I emailed Hellie and said, "She has more plot in the first hundred pages of this than I have in two manuscripts." LOL! Just finished reading this book yesterday at lunch. Love, love, love it--and can't wait to read Alex's book next. :) But I have a real soft spot for Sam. I love a hot geek! He's so adorable. There was a comment about a cat with jewels and stuff--and it made me totally think of Lisa Kleypas, because I think she's kinda geeky about her cats, but I think her husband is kinda geeky in other ways...I don't know. It's sometimes cool to see insights of the author coming out in the writing. However small. Sam will definitely stick with me for a while. I love the t-shirts thing. All the science ones and she'd call him a geek when he'd explain them. And the "I don't love you either." This book is on my TBR pile and I think I have the audio book too. Having enjoyed the first book in this series and reading your review I'm going to have to move it up in the pile! I also loved this book for the same exact reasons... and was leery of reading it because of the blurb on the back. I saw Big Misunderstanding a mile away and didn't want to go there again! I love when an author takes the high road. I'm starting to call romances like these adult romances in my head. No gimics, bad guys or Big Mis setups, just 2 adults dealing with real issues - commitment phobia, fear, trust issues, etc. I read another contemp recently that had me sweating in my seat because of the possibility of it going the Big Mis route and the author did the same thing. She had them deal with it and move on. Hopefully this is a new trend. I, too, am anxious for the third book. I've read a lot of negative stuff on the net about LK's insertion of magic, ghosts, etc. and I just don't see the problem. I don't think it detracts from the story at all and it's kind of cute. The ghost aspect in the third book has sparked my interest. I love that I'm trying to convince people to read this and you all either already have or you've bought it already. LOL! This is why I need to read more and right when they come out. I love the magical elements in this. They're very subtle. Though it looks like the ghost will play a larger role, I'm happy about that. Nora has etched magic into contemporaries many times over the years. I loved that Irish Trilogy mostly for the characters but the fairy magic was also a draw. If people aren't reading because of the magic, they're truly missing out. And I'd like to meet whoever wrote that back cover copy. (I hope it wasn't Lisa!) It's so misleading. Okay. You sold me. I'm going to stick this one on my TBR list at Pinterest. This sent me over to my Goodreads account where I read my impressions one of her historicals. I found it "Meh" for a variety of reasons. But...I don't think I'm the right audience for historicals. (I don't "get" Jane Austen, either.) I'm thinking that Kleypas's contemps might be more my style, rather than her historicals. Move it on up, Scape! Pat - There's a similar voice in her historicals and contemps, but for me, what I get in her historicals I can get from others. But what I get from her contemporaries I can't get from another author. Maybe that's why I like them better. I like her "voice" well enough. But the story (historical) made no sense to me. There was no significant obstacle to a HEA. Even though the plot was primed with a humungous issue, it was largely ignored. Also, it was a case of insta-lust, which bores me. I didn't hate it; just found it..."meh." But most historicals from that time period don't do much for me. When it comes to Romance, I think I may prefer contemporaries.